These two one-of-a-kind wooden boards were hand painted by Marj Serr. 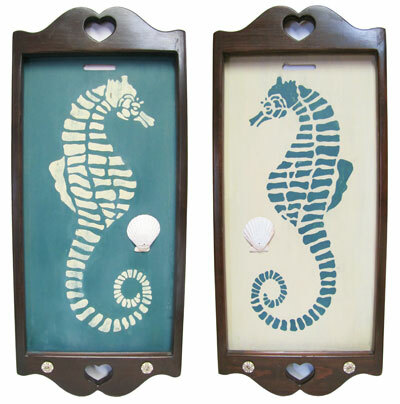 One of the boards features a white seahorse painted on a teal background and the other board features a teal seahorse painted on a white background. Each board has been embellished with a seashell and decorative buttons. The measurements for each board are: 29.75" x 12.75".